Discussion in 'General Discussions' started by Maha_3, Jun 26, 2018. * need more explanation about Index & Offset functions. * when to add ($) when to not ? 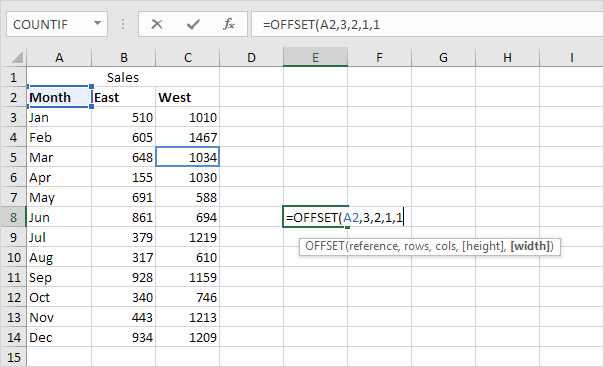 The OFFSET function in Excel returns a cell or range of cells that is a specified number of rows and columns from a cell or range of cells. The OFFSET function below returns the cell that is 3 rows below and 2 columns to the right of cell A2. The OFFSET function returns a cell because the height and width are both set to 1. The INDEX array form returns the value of an element in a table or an array based on the row and column numbers you specify. array - is a range of cells, named range, or table. row_num - is the row number in the array from which to return a value. If row_num is omitted, column_num is required. column_num - is the column number from which to return a value. If column_num is omitted, row_num is required. For example, the formula =INDEX(A1: D6, 4, 3) returns the value at the intersection of the 4throw and 3rd column in the range A1: D6, which is the value in cell C4. A dollar sign $ is called a locked cell reference. Locked cell references are one of the building blocks of Excel modeling. Without them, you will waste endless amounts of time re-writing formulas. Locking cell references will anchor formulas in specific ways so that we can copy and past them without having to rewrite them. Here is a lesson on the three types of locked cell references and how you can use them to copy & paste your formulas. If you still get stuck somewhere, please let me know. I am a little confused with the use of offset function in lesson 4.10 and lesson 4.12. Why did in one instance we used =offset($B$6, row()-6) and in another instance row()-15? In Excel ROW() returns the current row number, which will help to specify the data value.